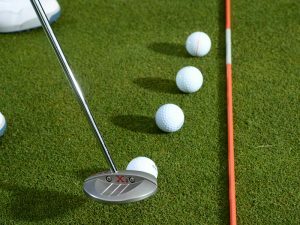 Before we get into our putting arc drill, the first thing you need to do is to draw a nice line on your golf ball so you know the putter face is square to your chosen line at impact. 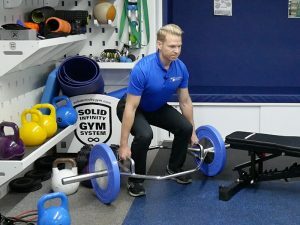 The easiest way to do this is with one of the little devices you can see me using here and in the video. 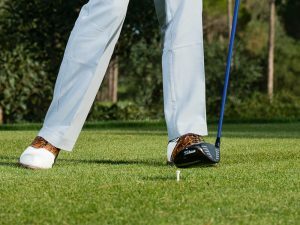 Then set up an arc of six or seven golf balls just feet-side of your ball. 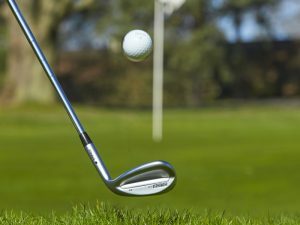 This represents the gentle and natural arc that your putter should ideally travel along as you make your stroke . 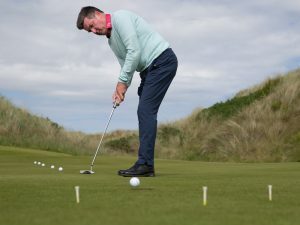 Don’t put your ‘live’ ball down at this stage, but rather slowly move your putter back and through just outside the arc, following its gentle curve. 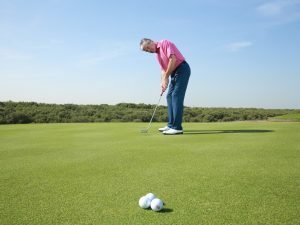 Then speed things up to normal putting pace before introducing your ‘live’ ball. 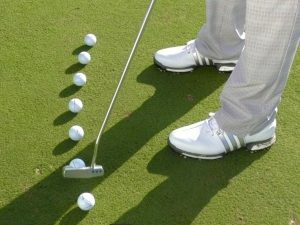 Again, let your putter’s movement mirror the arc of balls just inside your ball. 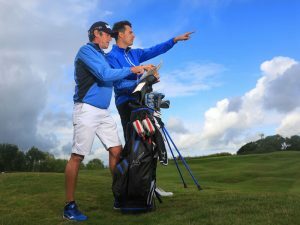 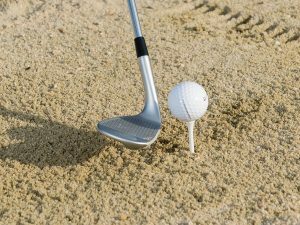 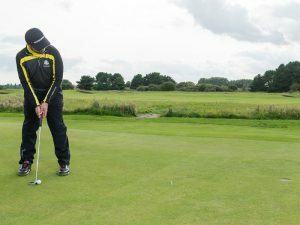 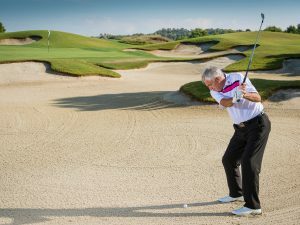 This drill will help engrain the gentle natural arc your putter must follow – it would be impossible and unnatural to take it straight back and through given the angle that you’re standing at and the angle of the shaft. 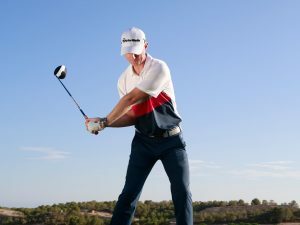 Practise this, and your stroke will be more natural and more instinctive out on the course. 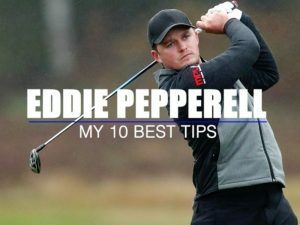 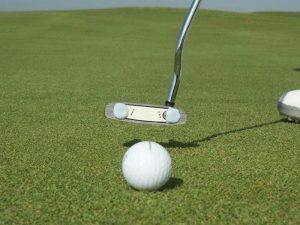 Drawing a line on your ball with one of these gadgets will help you set your putterhead square to your chosen line more easily and more consistently. 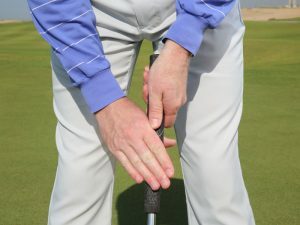 Another way to do the arc drill is to grip down on your putter, then hover it over the arc of balls and move the putter back and forth above the balls as I’m doing in the accompanying video. 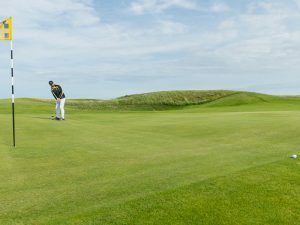 Either option works just as well, but visually, you may find it easier to really hone your natural arc with the hover option. 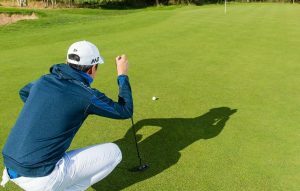 You can do this on the practice green or, equally, on the carpet at home!